All instruments are fully reconditioned, complete ready for use and come with 1 year warranty. Installation, training and service available. Calibrated for optimum performance ready to be used. Parts, accessories, service and support are available. WE WILL BEAT ALL COMPETITOR PRICING. IF YOU HAVE A QUOTE, SEND IT TO US. WE WILL SAVE YOU MONEY ON YOU'R INVESTMENT!!! The Diamond DSC is designed using the unique power compensation approach, which yields true heat flow measurements. Because of the very low mass (<1g) and independent furnace design of the power compensation approach, the Pyris Diamond DSC provides both the necessary very high sensitivity and unsurpassed resolution necessary for the measurement of polymorphism exhibited by pharmaceuticals. DSC Type: Power-compensation temperature null principle. Measures temperature and energy directly, rather than differential temperature (DT). DSC Cell: Independent dual furnaces constructed of platinum-iridium alloy with independent platinum resistance heaters and temperature sensors with furnace mass less than 1g. Temperature Sensor: Distributed, Platinum Resistance Thermometers for best linearity. 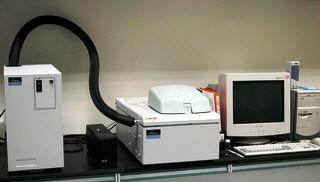 The differential scanning calorimeter can analyze solid or liquid samples. 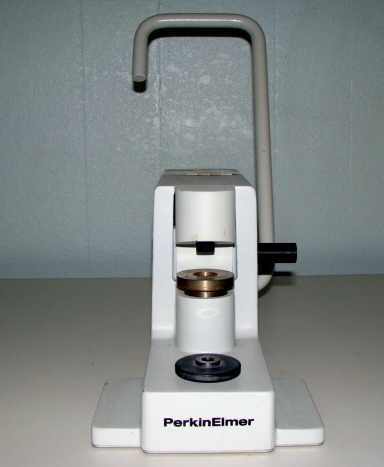 Solid samples can be in film, powder, crystal, or granular form. Although quantities accuracy will remain the same regardless of sample shape, the qualitative appearance of run may be affected by the sample configuration. Proper sample preparation that maximizes the contact surface between the pan and the sample will reduce the resistance of the sample to heat flow though the DSC temperature sensors and will result in maximum peak sharpness and resolution.